Most everyone has heard of a famous Chicago ghost story. Two of the most famous ghost stories are the 1871 Chicago Fire and the Valentine's Day Massacre. Read on to learn more about these fascinating stories that intrigue ghost hunters to this day. Do you remember hearing about the cow in Mr. O'Leary's barn that kicked over the lantern, which started the Chicago fire? Whether a cow was really responsible or not remains a mystery. What is known is that right before the now famous fire there had been no rain for at least three weeks, as reported by the local newspaper, the Tribune. It was a dry season, and many of the buildings in Chicago were in poor condition, constructed of old wood or brick. There had been less than three inches of rain between July and October that year. On the evening of October 8, 1871, a fire started in the vicinity of the O'Leary home, on the west side of Chicago. By 10:30 that evening, local firemen declared that the fire was out of control. They didn't have enough manpower to fight the quickly spreading flames. Bystanders stated that it looked like "red rain" was falling across the city. By midnight, the entire west side of Chicago was burned to the ground. The fire then jumped the river and continued its rampage. It traveled to the center of the city and wiped out all of the businesses, both large and small, including the Tribune, whose building was believed to be fireproof. The fire continued through the city, and in the early morning hours, it destroyed the Water Works on Pine Street. The only thing that survived in that area was the gothic stone water tower, which still stands today. Father Damen - prayed that his church would be spared, and it was. He still wanders around the Holy Family Church on West Roosevelt Road. Hang Man of the Water Tower - this man worked tirelessly trying to aid firefighters during the fire. He took his own life by hanging himself, rather than being burned alive by the fire. On February 14, 1909, seven men were killed as a result of a gangland feud. The feud between the two gangs was related to the bootlegging business. It was a dispute over a dog track and in retaliation for the attempted murder of Jack McGurn. Al Capone decided to make a hit on Bugs Moran and his gang at the SMC Cartage warehouse on North Clark Street. Two of Al Capone's gang members, dressed as police officers, entered the building after the Moran gang had entered. They told the men to line up against a wall. Historians believe that the gang members didn't resist because they believed it was just the police attempting to get some good press. Suddenly, two other men arrived with sub-machine guns and quickly shot the men who were lined up with 72 rounds, and another 2 rounds from a shotgun. Six of the seven men were killed instantly. The last man died, hours later, and claimed that the police had shot him. A dog named Highball survived the massacre by hiding under a beer truck in the warehouse and alerted neighbors afterward with his howling. Bugs Moran survived the massacre, either because he was late, or he saw what he believed were police officers and left the scene. To this day, strange occurrences happen in this now vacant lot. The original building was demolished years ago. People have reported hearing a sub-machine gun or Tommy gun noises, seeing gangster apparitions appearing and outlines of the seven bodies in the snow. Residents of a nearby senior housing facility, as well as some of their visitors, have reported seeing ghostly gangsters entering their rooms at all hours. People who walk their dogs by the area report that their dog will try to bolt past the area, with its tail tucked between its legs, or it will begin whining and howling. When the building was torn down in 1967, many people purchased bricks from the building, including those still filled with bullets from the massacre. People who own the bricks may wish that they didn't. Some who salvaged these bricks believe that the bricks are haunted, and others believe that the bricks curse anyone who owns them with bad luck, illness and even death. If you're easily frightened, then you'll want to avoid traveling near Resurrection Cemetery. The ghost haunting this area is known as Resurrection Mary. She is reportedly seen at the cemetery gates and also asks passersby for a ride only to vanish once inside their car. 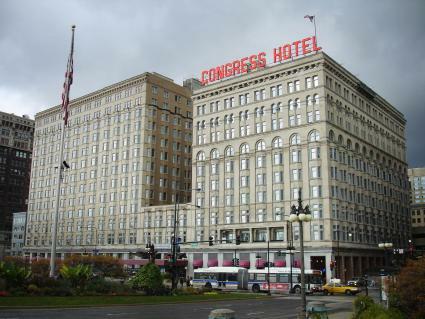 The Congress Plaza Hotel is one of the most haunted places not just in Chicago but the state of Illinois! Located in downtown Chicago along the harbors, the history of the Congress Plaza Hotel is filled with murder and corruption. Ghost hunters favor the South Tower since it's believed to have the most ghostly activity, especially the staircase and floors three and four It isn't surprising that the spirits of gangsters and various colorful people refuse to leave this haven. In fact, you can join in the Congress Plaza Hotel's annual Haunted Halloween Ball and possibly encounter one of the many resident ghosts. Al Capone is seen often in the bar, lobby and eighth floor of the hotel. The Congress Plaza Hotel was once home to the notorious gangster during the 1920s and 1930s) as well as many of his friends and business contacts. Room 441 is haunted by a dark female shadow that kicks them awake, throws objects and makes frightening sounds. It's said to be the inspiration for the fictional suicide story 1408. Peg-Leg Johnny is an unknown ghost that haunts the hotel, although it's assumed he was homeless and his peg-legged body discovered in the hotel alley. His murderer was never captured. He enjoys turning lights and appliances on and off. Mother and Sons: The apparition of a young boy is seen throughout the hotel often running after guests. It's believed the ghost is of a young boy whose body was lost after his distraught and abandoned mother threw him and his brother out a hotel window and then jumped to her death after them. In 1875, the bodies of several naked women were discovered in barrels marked poultry at the modern-day location of Hooters on Wells Street. Employees hear whispering disembodied voices in the basement. Chicago Water Tower is located at 806 North Michigan Avenue. This Gothic Revival building (circa 1867 and 1869) housed a water pump for the municipal water system. Its claim to fame is being the second-oldest of its kind in the United States. The tower is said to be haunted by a worker who answered the call of a fire in the tower but had to retreat to the top of the tower when the flames overtook the building. Rather than die in the fire, he hanged himself. His dark frightening silhouette is seen hanging in the floor windows. Today the tower is preserved as a historic landmark and hosts various exhibitions. The colorful and checkered past of this city dishes up all kinds of famous Chicago ghost stories. 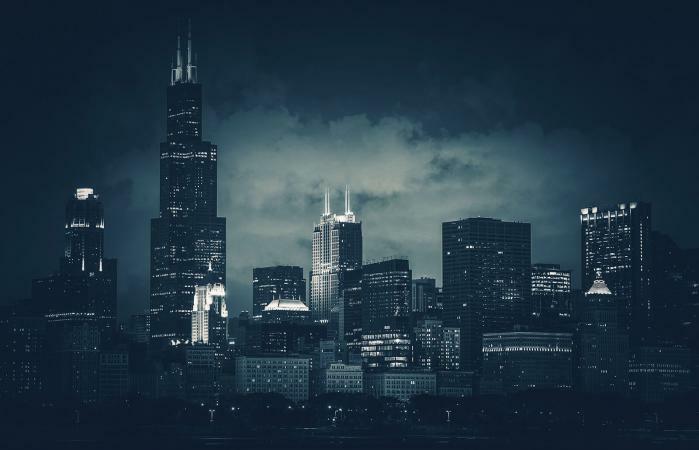 The stories of untimely deaths, gangsters and tortured souls are as much a part of the Windy City's legacy as these historical places and the people associated with them.